A local man who tried to conceal marijuana under the seat of a patrol car faces multiple charges following his Aug. 14 arrest. Coty Brandon Ferrell, 113 Stage Road, Woodbury, was stopped by Woodbury Assistant Police Chief Kevin Mooneyham on McMinnville Hwy. on that date. A check of his license revealed it was revoked for DUI 3rd Offense in 2008 and that he had been cited twice previously for the offense OF DORL. Ferrell allegedly had in his possession a plastic baggie containing a green plant material believed to be marijuana, which he tried to hide underneath the seat of the patrol unit. 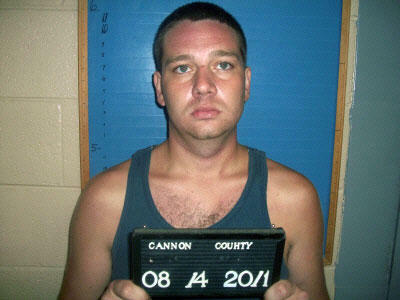 While being booked at the Cannon County Jail, a pack of rolling papers was found in Ferrell's possession. Total bond was set at $6,500. Ferrell is scheduled to appear in Cannon County General Sessions Court on Sept. 20 to face charges of driving on a suspended license 3rd offense, simple possession of marijuana, possession of drug paraphernalia, driving an unregistered vehicle and violation of the financial responsibility law.